We had admired Huaycool when we saw Kay Patterson showing him and at a judges clinic she hosted in 2007. In the Summer of 2009, we made arrangements to breed our very best producing female Bros Normandie to him. In 2010 we had a drop dead gorgeous baby by him that sold immediately and won Best of Show at her second show out. "JNK Huaycool's Frisella" has continued to do well in halter winning numerous Grands and Reserves. We kept our 2011 girl "JNK Huaycool's Rosabella." Rosabella won Grand and Reserve Grand at her first show in the largest division for that show. She finished all 6 of her ILR Halter titles in five shows. In 2013 she ended the season with double Best of Show Female titles. Rosabella finished the 2014 show season as ILR-SD Highpoint llama for the Northwest and Best of Show Female. In 2015 she finished the season again as double Best of Show Female. 2016 she ended as Best of Show and NW ILR-SD Highpoint llama again! "Huaycool's Cool Breeze" (owned by the Howks) won her first show out of the gate also. 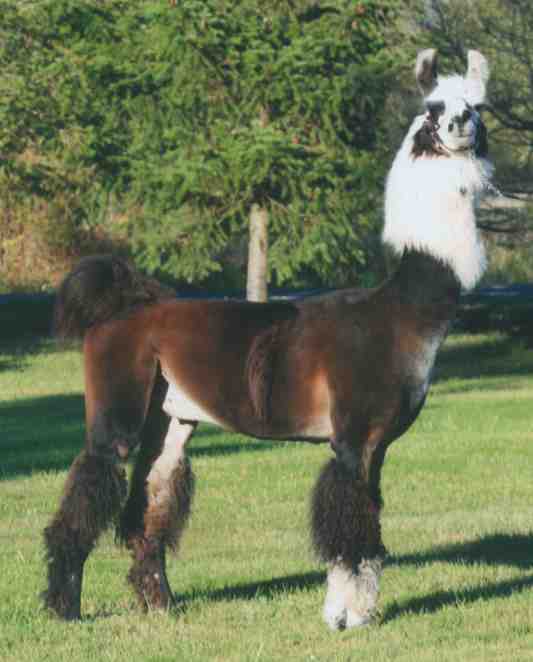 The Schlemmers of Indiana are winning in halter, performance and fleece classes with "JNK Huaycool's O-So-Kool." With a very limited production history, Huaycool has far exceeded our expectations. Huaycool is what we consider a total package llama. 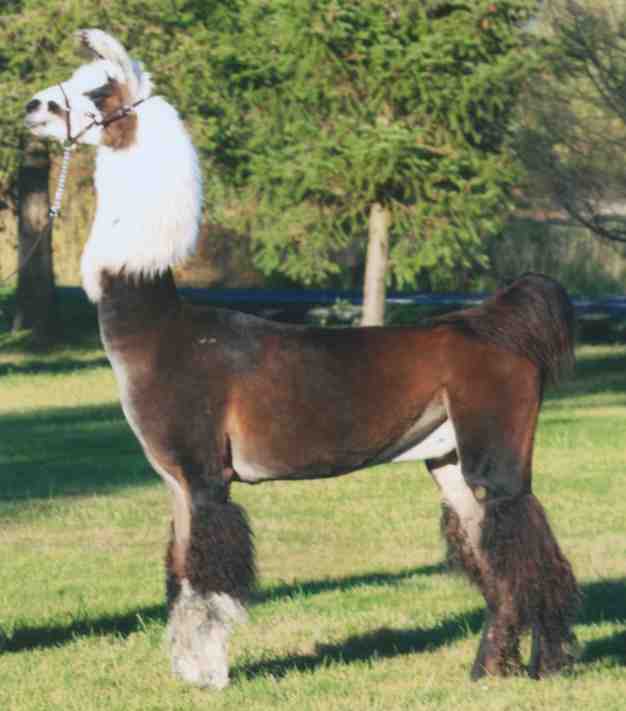 A llama that has bone, size, style and to top it all off, a wonderful disposition. He is completely outcross to all U.S. lines and has done really well in a limited show and breeding career. At the 2010 Hinterland Dispersal Sale we formed a four way partnership on him with three other farms who have similar breeding goals. We purchased Huaycool to use on our Marisco & Eagle daughters. He is invaluable to our program with his out cross lineage and his overall balance and substance. We are not offering any outside breedings at this point, to inquire about offspring for sale, please contact one of the partnership breeders. Huaycool is doing a heck of a job for our programs. So far we have gotten numerous halter and performance champions out of his get. *Huaycool has more show results, but we have been unable to get them to date.